Technology-Portfolio.Net - After Samsung launched several A-series smartphones, now the company finally launched the first smartphone from the A-series that carries a cinematic screen. 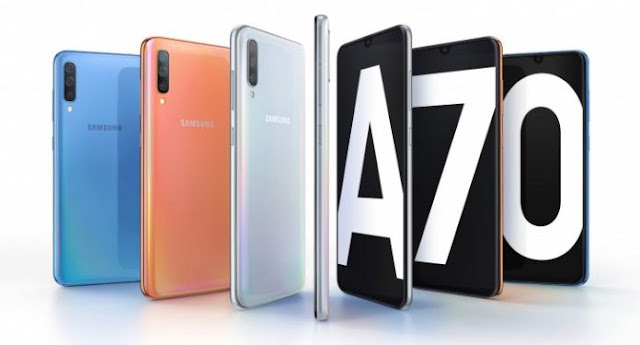 The Samsung Galaxy A70 has just been launched, where this smartphone offers a 6.7-inch wide screen with an extra high aspect ratio of 20: 9. This is the Infinity-U display that seems long. The 6.7-inch screen sounds pretty awful, because it's almost the same as a tablet, but calm down because thanks to the aspect ratio of 20: 9, the width of this smartphone is only 76.7mm which is almost the same as the 2018 Galaxy A7 and Galaxy Note 9. Of course navigation uses one hand still possible. The front camera of this smartphone is 32MP resolution and the rear camera also has a 32MP f / 1.7 sensor. But for the rear camera also features an ultra wide angle 8MP 123 ° module and a 5MP depth sensor. The Galaxy A70 offers fingerprint scanner sensors in the screen as well as facial recognition as a security mechanism. The Galaxy A70 has a 4,500 mAh battery and interestingly, this smartphone will support 25W fast charging. That is the first Galaxy smartphone to surpass 18W, apart from the Galaxy S10 5G (which is not yet available). This smartphone will come in a choice of 6GB or 8GB RAM with 128GB of internal storage. The card slot can accommodate two SIMs and one microSD (up to 512GB), where this will give you a lot of flexibility. The operating system that runs this smartphone is the Android 9 Pie with the appearance of the One UI interface that makes various features such as Night Mode and Knox. The Galaxy A70 shares the "3D Glasstic" body with other A series phones. The prism effect will give a visual impression on four color choices, namely Coral, Blue, Black and White. Unfortunately, the price and availability of the Galaxy A70 is currently not specified by the company, but the company said it will reveal more on the upcoming April 10, 2019.